A variety of non-profit agencies provide services for people without housing in Madison and Dane County. Porchlight Inc. is an agency that provides temporary housing, a daytime resource center and emergency shelter for homeless residents. On Tuesday, February 28, Fromagination sponsored and assisted with an event to raise funds for Porchlight. The 2017 Original Chef’s Tasting was a dinner held on the University of Wisconsin-Madison campus, and supported with donations from 10 other area restaurants and food businesses. 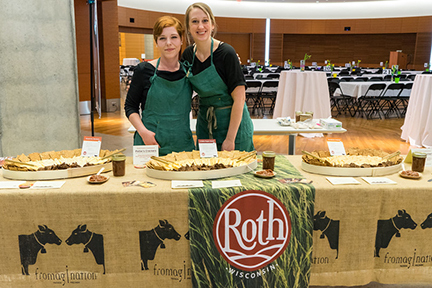 For the Porchlight event, Fromagination coordinated with Roth Cheese to serve Wisconsin artisan cheese as the appetizer for guests who purchased dinner tickets. Two Fromagination employees staffed the event, held at the Wisconsin Institutes for Discovery, and provided a tasting card for cheeselovers who wanted to know more about the great cheese. Grand Cru Surchoix is a washed-rind, Alpine style cheese which gains complexity with age. Fromagination sells other ages of Grand Cru, but the Surchoix is most highly prized. Roth also makes GranQueso which, inspired by Spanish and Portuguese cheese, is rubbed with spices, including cinnamon and paprika. Three Pepper Gouda is a traditional Gouda-style cheese with a twist – it’s made with Chipotle, Habanero and Jalapeño peppers. This entry was posted by Kyle Richmond in News & Announcements and tagged donations, Fromagination, homelessness, Porchlight, Roth Cheese.